In the spring of 2015, we were on a team of twelve MTSU graduate students. For our Essentials in Museum Management course taught by Dr. Bren Martin, we planned and developed a full-scale exhibit at Murfreesboro’s Central Magnet School within a span of about three months. The school has an educational legacy that dates back to the 1840s when it opened as Union University–a school for Baptist men. Damaged during the Civil War, the university moved to Jackson, Tennessee, but the same location was used for the Tennessee College for Women beginning in 1907. The site was vacant once again after the TCW merged with Belmont University in Nashville. After its buildings burned down in 1944, Central High School started to occupy former TCW buildings in 1950, making it the first coeducational institution on the land. It became a middle school in 1972, and then a magnet school in 2010. Today, Central Magnet School is one of the best in the state. Except, CMS students had no connection to the extensive, significant history of their school’s landscape. Determined to unite these students with the past, we developed engaging exhibit panels, entertaining educational lesson plans, and powerful public programs. From 1950 to 1972, the site operated as Central High School and from 1972 until 2010 it operated as Central Middle School, with many of the alumni still residing in Murfreesboro. As a community-driven project, we asked for oral interviews and artifacts the alumni wanted to donate or loan. Our preliminary research shed light on a few oral histories from Central High School staff members available at the AGRC . Sarah was our exhibit designer and responsible for designing, editing, and finalizing our seven exhibit panels. As marketing coordinator, Casey’s job was to promote our project and work with our education team to help connect our residents across generations. Our project manager, fellow Public History M.A. student, Ethan Morris oversaw the entire process, secured funding from community sources, and helped present our work over the last few weeks. 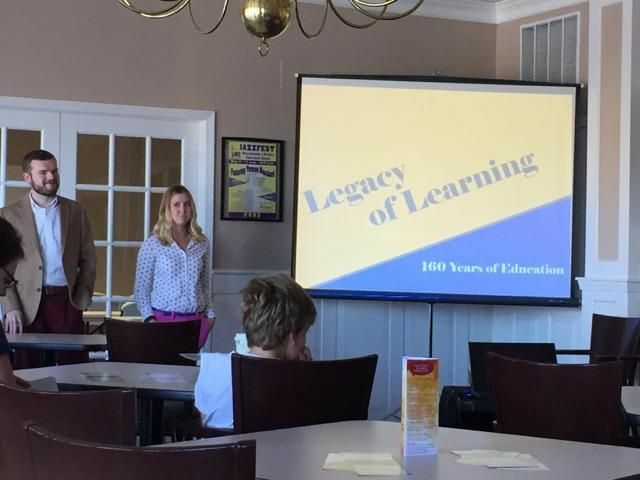 Ethan Morris and Casey Gymrek present the Central Magnet School exhibit to community members at Murfreesboro’s Heritage Center on October 6, 2015. Every October, the Heritage Center of Murfreesboro and Rutherford County hosts a series of community heritage talks that focuses on the history of Rutherford County. Dr. Martin, Ethan, and I were invited to present our exhibit as the first of these talks. We discussed the process of the project, the difficulties we encountered, and the power of community collaborations. After our presentation, audience members shared stories and asked further questions, which really helped to emphasize the mass potential of this type of project. As we learned, no matter how many objects we collected or how many oral histories we conducted, there was always more to uncover. Additionally, this talk at the heritage center was a good opportunity for us to prepare for our presentation the following week at the Southeastern Museums Conference. 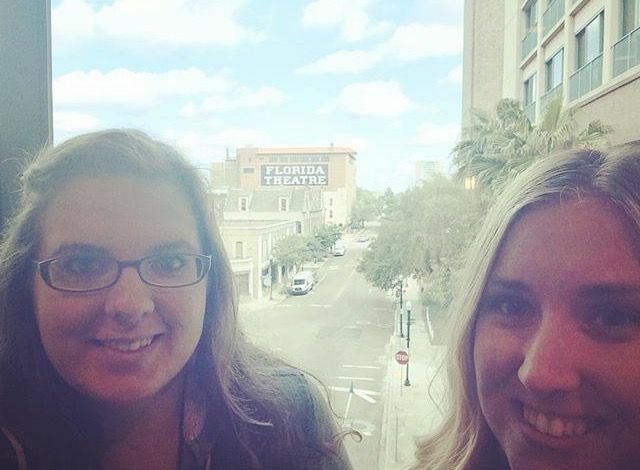 Casey and I attempt a selfie at the Southeastern Museums Conference showcasing the historic Florida Theatre in Jacksonville, FL. On October 13, we presented with three other groups of students in Jacksonville, Florida at the Southeastern Museums Conference. The students chosen to present at SEMC were picked from a larger pool of applicants, so it was a great honor for our work to be recognized by top museum professionals. After networking at the conference’s awards luncheon, we gave a quick 10-minute presentation on the Central Magnet School exhibit and answered questions for five minutes. The audience took a great deal of interest in the social and racial history associated with the exhibit; most notably, they wanted to know more about the public program implemented through a partnership with African American community members. The public program involved a whole day of events in which former African American students returned to discuss the racism and discrimination they encountered during their school years. The program was a huge success for both current students of Central Magnet and those who were speakers. It was truly one of the first steps ever taken toward community recognition of Murfreesboro’s racial past and social tensions. There are tentative plans to continue the program in the future. As previously mentioned, there is always more to uncover and more to discuss. When we began this exhibit in January of 2015, none of us ever imagined it would have such an impact on the local community outside of the current students. We hope that, long after we have graduated, the community continues to build partnerships for examining the town’s racial history and to begin the process of community healing.